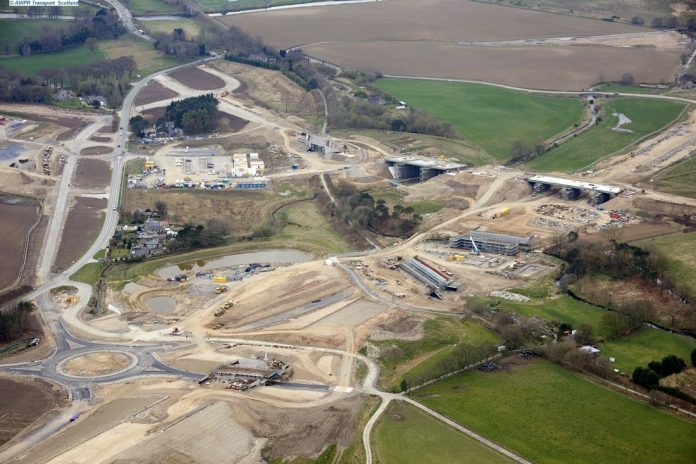 The Aberdeen Western Peripheral Route (AWPR) project. The contractor reported a strong underlying group performance producing record pre-exceptional profits of £84m. Half year revenue was at £1.41bn, which was down 5% from £1.49bn. Galliford Try has a current order book of £5.4bn. The firm, which completed 3,069 new Linden Homes, noted that average net debt decreased to £126m, from £203m in the first half of 2018. However, Galliford Try’s Construction division which accounts for around half the revenues experienced its first-half operating losses widen from £17.8m last time to £19.7m this time. Work on the £745m Aberdeen Western Peripheral Route project is now complete, but handover is yet to be accepted as Transport Scotland demands assurances about future maintenance. Peter Truscott, Chief Executive, said: “We were delighted to achieve completion of the AWPR with final handover in progress, successfully delivering a vital and major piece of infrastructure to the local community. We continue constructive dialogue with our client regarding important and recognised claims. “Linden Homes delivered a strong performance in the first half, despite the continuing political uncertainty and its impact on confidence. “Partnerships & Regeneration is performing very strongly, both at revenue and margin levels. Truscott added: “The Group enters the second half of the year with a solid foundation, underpinned by a strong balance sheet and our focus on high-quality earnings which will drive further margin improvements over time.